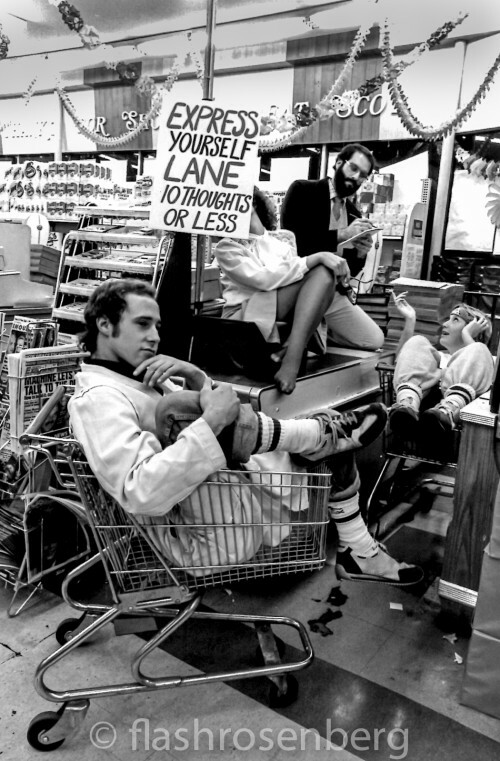 This week, we’re featuring the ever-imaginative cartoonist, photographer, performer and (among many, many other things) writer Flash Rosenberg, whose photographs will be featured at the Delaware Art Museum starting June 27th, 2015 as part of the “Dream Streets: Art in Wilmington 1970-1990” exhibit. This is a major group show celebrating the 70s and 80s art scene in Delaware, where Flash was a dynamic instigator and provocateur at the beginning of her art career. Flash’s black & white photo-cartoons will be featured, along with her catalog essay about that era’s photo hijinks and ideas. Each day, we will feature one of her photographs, captioned by the photographer herself. Supermarkets have always struck Flash as a paradise for surrealism. ~~~Flash Rosenberg is a Guggenheim Fellow and “Attention Span for Hire” who draws, photographs, writes and performs. As artist in residence for LIVE from the New York Public Library she drew literary discussions in real time to create animated Conversation Portraits. She translates complex concepts into instant drawings for major clients, such as Visa, Gatorade, Verizon, Ford Foundation the United Nations and more. 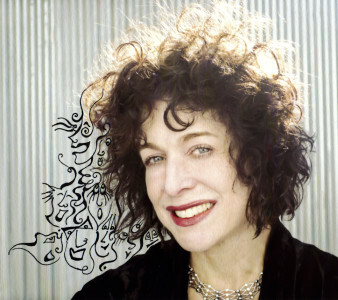 Her writing has been featured on The Moth Radio Hour and her animations appeared on Broadway in The Rascals’ “Once Upon a Dream.” Her FlashThink cartoons were a weekly feature on Archetypes.com. She teaches at The Art Students League, hosts Flash Perception Lab, and conducted photo perception classes on the NYC subways for Cooper Union. Her Flash Moments aired daily for 5 years on WXPN 88.5 fm. Flash Rosenberg Studio is a full service photography, motion picture, merriment and mischief factory based in New York City. She lives with three turtles and infinite questions. Posted in Activity Ideas, Exhibit Ideas, Featured Creatives, Good Ideas, Gordian Knots, Inspiration, Performance Ideas and tagged art, Delaware Art Museum, Express Yourself Lane, Flash Rosenberg, Gordian Knots, photo humor, photography.